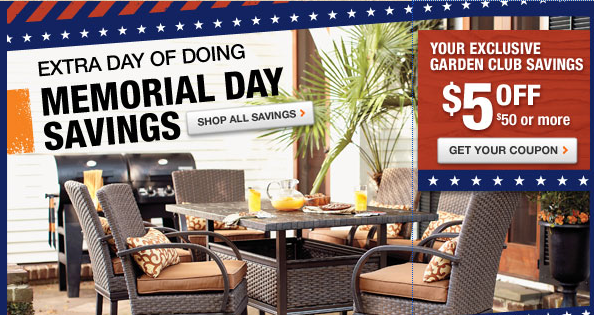 Home Depot Garden Club Coupons: $5 off $50 Lawn & Garden! 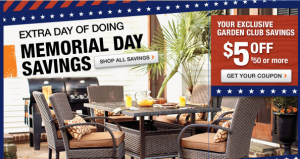 If you are signed up for the Home Depot Garden Club, be sure to check your email for a $5 off $50 Lawn & Garden Coupon especially if you plan on doing some gardening this weekend. The coupon is good through 6/17 so I’m excited because I will have it available for when I move. If you haven’t signed up for the Home Depot Garden Club, be sure to do so. Once you sign up for the Garden Club newsletter, you will start to receive coupons via both email and the mail. I’m actually hoping for some BOGO Vegetable Plant coupons since the new house we are moving into already has a great vegetable garden space that will be needing some plants! Today’s Daily Deals – Entertainment Weekly, Fathead.com, Houndstooth Baskets & More!